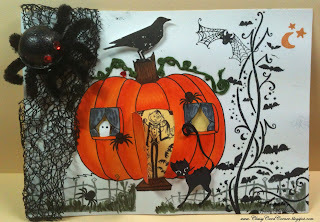 Joanie's Classy Card Corner: BOO!!! Hope I didn't scare you. ; ) Today I created a Halloween card using one of the images from Fresh Brewed Designs that I was given to do for a blog hop. Well, I choose the pumpkin... that's the big orange round thing in the center... lol So here we go and I'll talk more about it in a few. Well, I just didn't want a cute pumpkin, so I decided to give it a little Halloween touch. ; )) So I had a few Close to My Heart "Autumn" stamps, sort of spooky for Autumn, but great for Halloween, so I have my bat tree, and I fussy cut the black cat and the raven, added the netting, oh,no, I mean the spider webbing, scuse' me, and the really scary, fuzzy black spider with the red eyes. Where's the bug spray? lol I also, opened the door of the pumpkin and who did I find there? Dracula!!! Oh, my and a ghost looking out the window! Spiders are crawling everywhere! Oh, so glad I don't live there, I would be screaming. I hope my silly creation put a smile on your face and if so, that's what I intended to do. 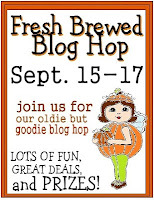 And you still have time to contact Fresh Brewed Designs and get your free images to do your card and get it entered in the Fresh Brewed Blog Hop. It's going to be lots of fun and lots of prizes, so come on and play along. Have a great day and thanks for stopping by and hope to see you back here real soon. 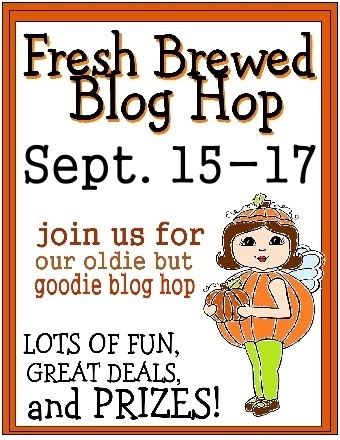 October 1st through the 14th is the Link Up for Pink Blog Hop. WOW! Thats incredible!!!! But I don't like the spider LOL! You so need to enter this in the Haunted Design House challenge - it is all about scary pumpkins - this is perfect for it. Love it! Woah! That's absolutely awesome ... love all the details and the guy behind the door is just adorable :-) The spider gives a wonderful touch, too .. Wow!! I am lovin this card!! Awesome awesome job! Love all the details it is gorgeous! and spooky fun! great card,I love the bat tree and the big ol spider.really like the bright pumkin with the mainly black stamping. This is one SUPER DUPER Halloween card!! !